Postpartum is a challenging time. After a challenging birth experience, exhaustion takes over. Yet, at the same time, a mom is woken every few hours during the night for feedings. While this is a fact of motherhood, there are small things that can be done to help soothe and make the task slightly easier. One of my favorite ways to do this is with swaddling. Swaddling a baby helps him feel more secure and reminds him of the comfort he experienced in the womb. When my baby was first born, we tried swaddling him with receiving blankets. It was a total fail. Then we received an aden + anais muslin swaddle blanket. It was a lifesaver. I learned how to use it properly in an instant; there was no learning curve. It worked like magic, helping my active newborn calm down enough to fall asleep on his own. I didn’t have to rock him for hours anymore. I was able to spend that time recovering as well. Our use of aden + anais swaddle blankets didn’t stop there. We continued using it after our baby outgrew it as well. We use it as a shade on the stroller, to help him sleep while on the go, and as a “stranger shade”. We used it as a floor mat for playing. We used it as a generous protective burp cloth. We used it for many more things as well. There is one thing that we were lacking, though. We only had one. That means that while it was in the wash, I had to go back to my annoying too small, non-breathable receiving blankets. That’s why the twinkle gift set is so perfect. 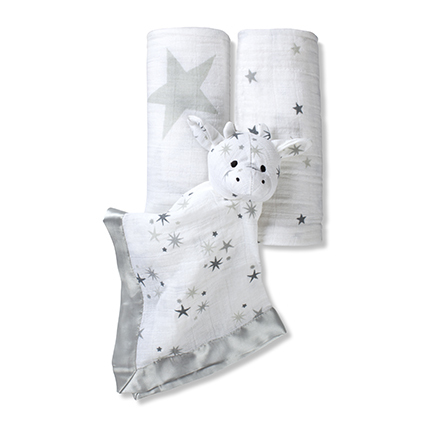 The twinkle gift set from aden + anais is the perfect little package. It includes two subtle gray muslin swaddle blankets. It also includes a musy mate® lovey – something my baby loves after he’s outgrown his swaddles. He bites the ears when he is teething, and the satin edge is soft and sensory. It’s also a great way to transition him from a bare crib to sleeping with blankets, now that he’s a year old. He loves poking at the eyes and staring at the face. The subtle pattern is sophisticated, and neutral, so it’ll match any nursery. The stars keep it playful. One of the greatest gifts you can give a new mom is to help make her transition into parenting easier. 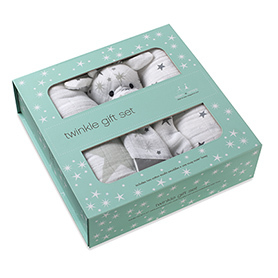 The twinkle gift set is perfect for this, as it contains three beautiful, useful products. The swaddle blanket is great for so many things, and the lovey will be a childhood favorite.